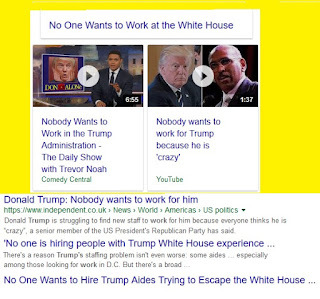 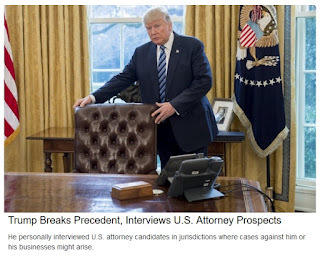 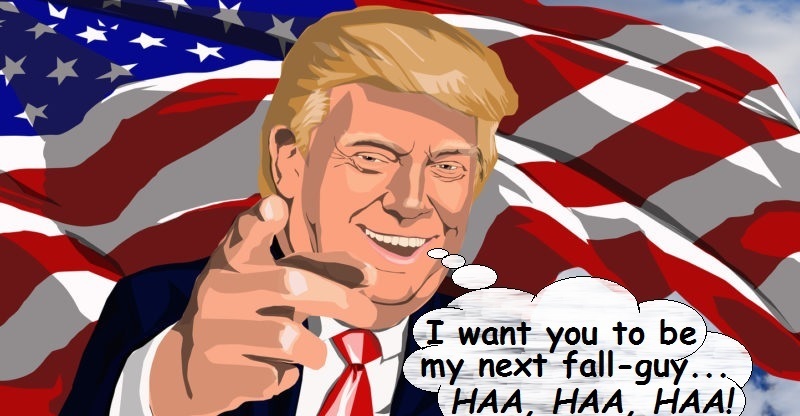 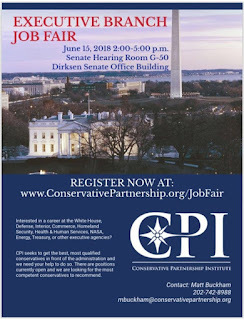 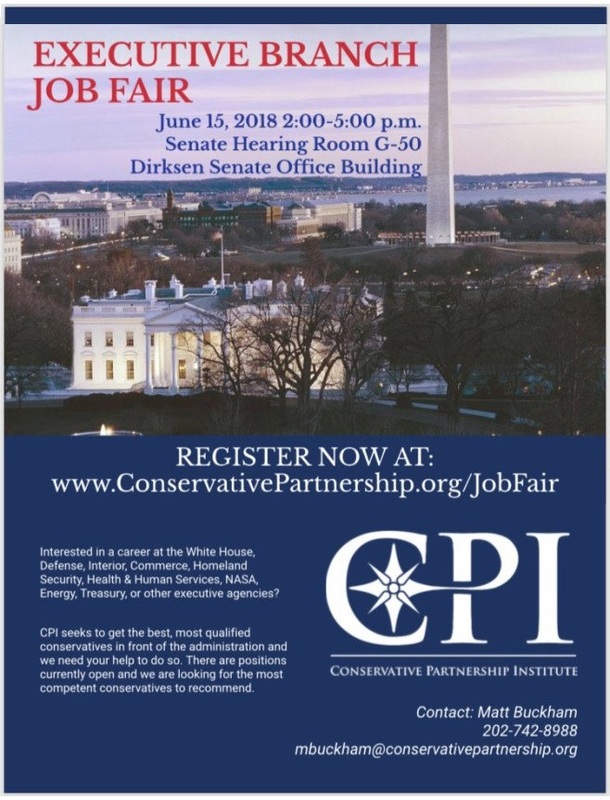 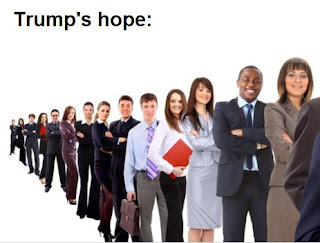 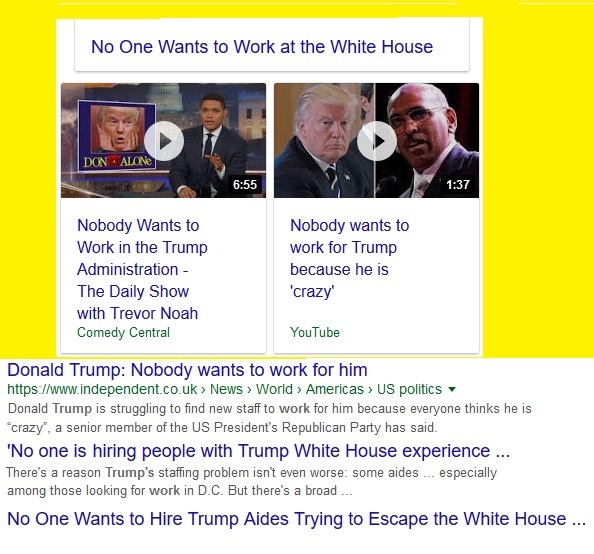 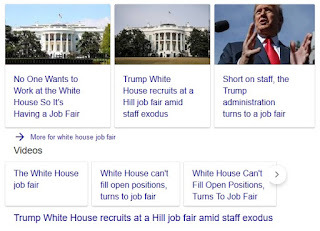 Mysterion's Postulates: White House job fair – first ever? 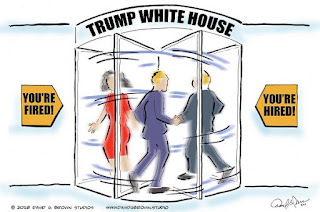 Three months after that Trump boast, the steady stream of departing White House staffers shows no sign of slowing, but Trump hatched a plan to replace them. 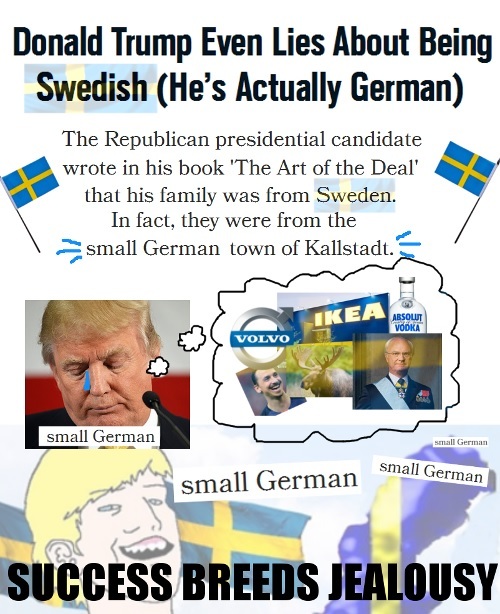 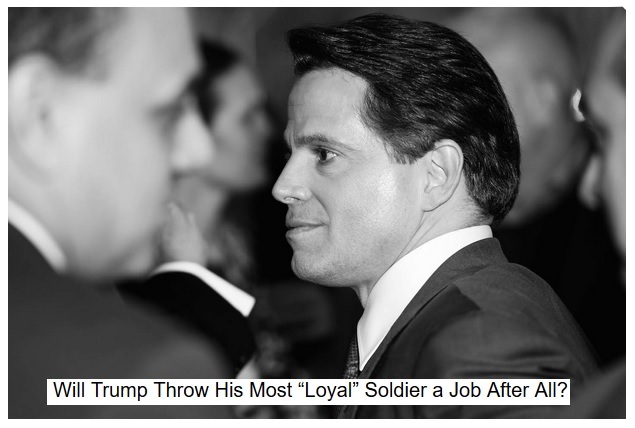 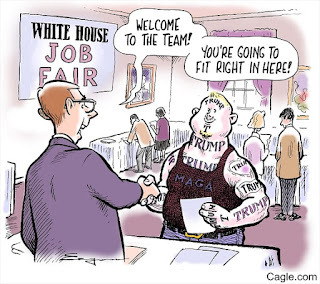 He held a job fair! 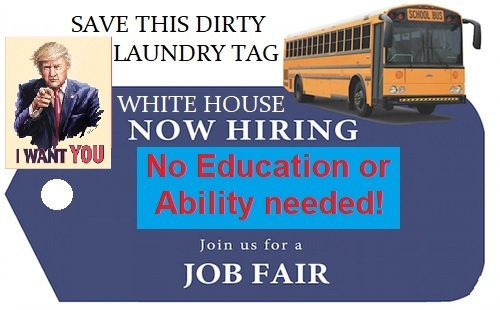 Not satire: #tRump's @WhiteHouse advertises at job fair amid staff exodus. 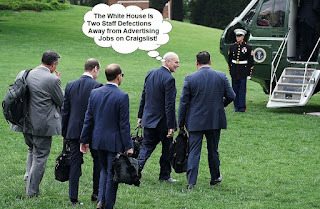 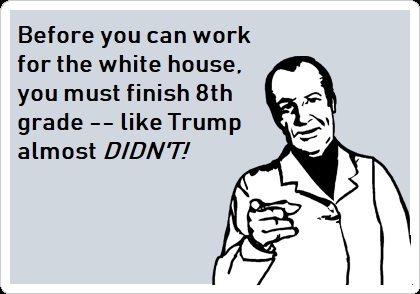 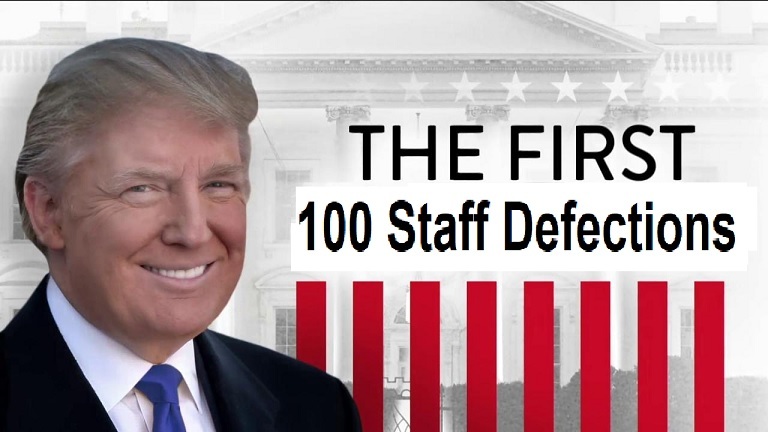 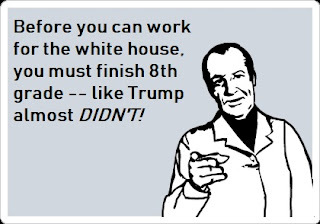 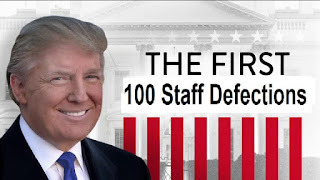 An Obama administration official said that they didn’t even bother to list jobs when they opened up in the White House. 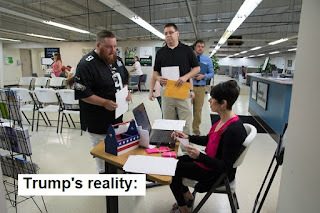 They had dozens of applicants for every opining - in reserve. 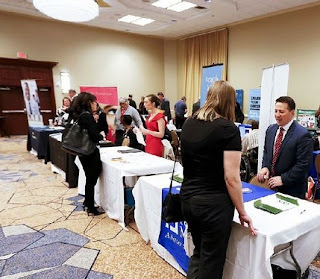 Given the severity of the problem, this job fair didn’t seem like a bad idea at the time. That is, until people start tweeting pictures of the sparse attendance. 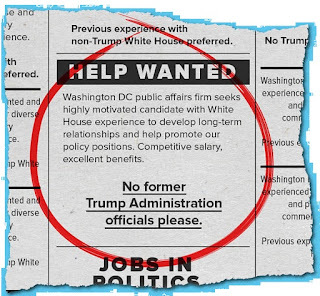 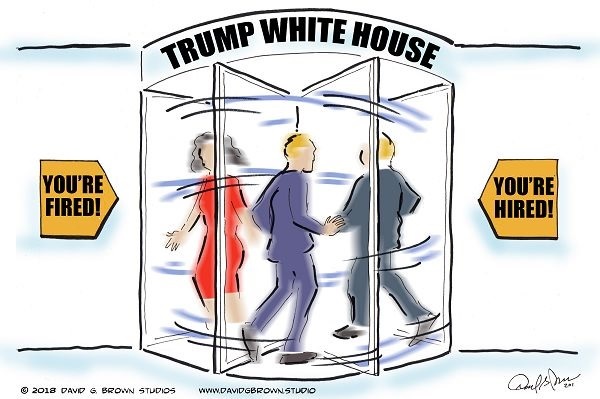 The flailing Trump White House, which has set modern-day records for both departures and firings, is being forced to host a job fair because it’s having extraordinary trouble getting anyone at all to work for the Trump administration. 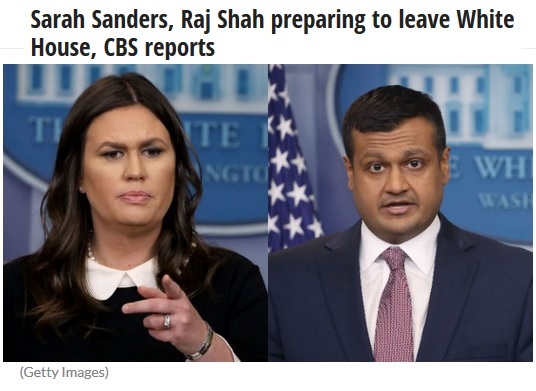 This news is both stunning and embarrassing for a couple of reasons. 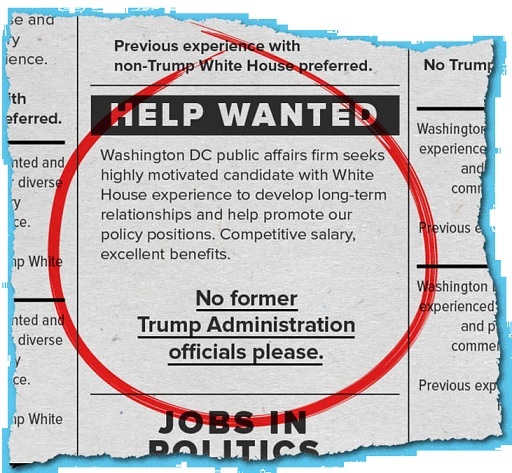 The administration is a year-and-a-half old, yet it’s still looking for employees. All of those jobs should have been filled long ago. 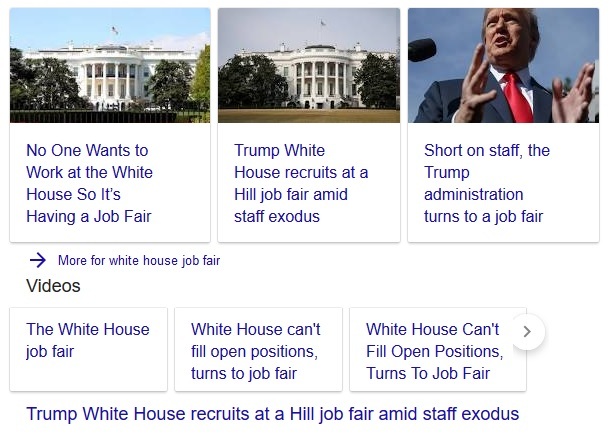 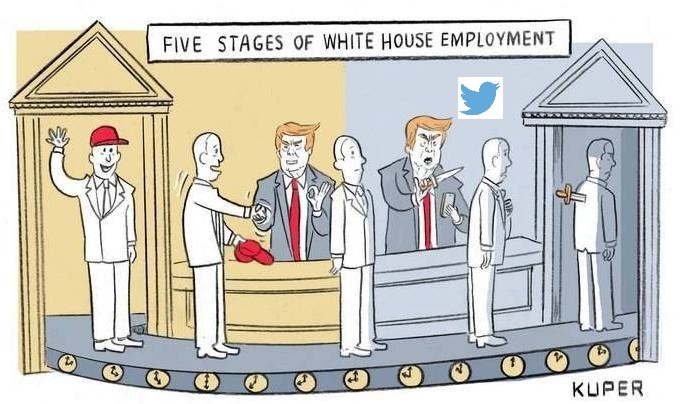 Other White Houses didn’t have to go begging for job applicants. But this White House, overseen by a pathological liar who’s ensnared by scandals, is known to be a “miserable place to work,” according to Trump’s chief of staff John Kelly. 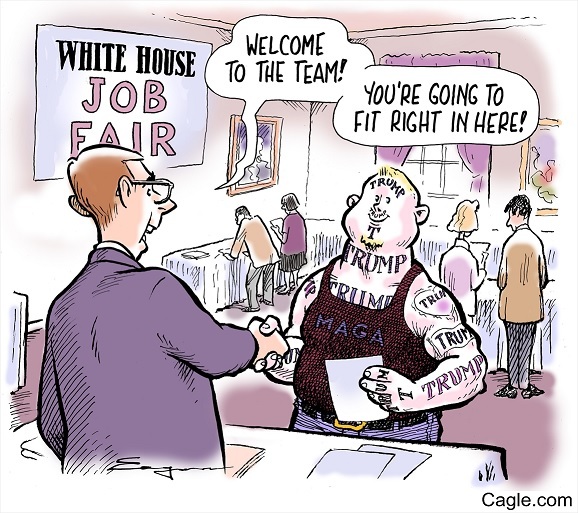 Trump employment has simply become too unstable and toxic for most Republicans. Serving as the President’s personal attorney used to be a crowning career move among white-collar attorneys. 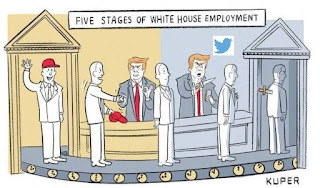 But under Trump, the position became cement overshoes. 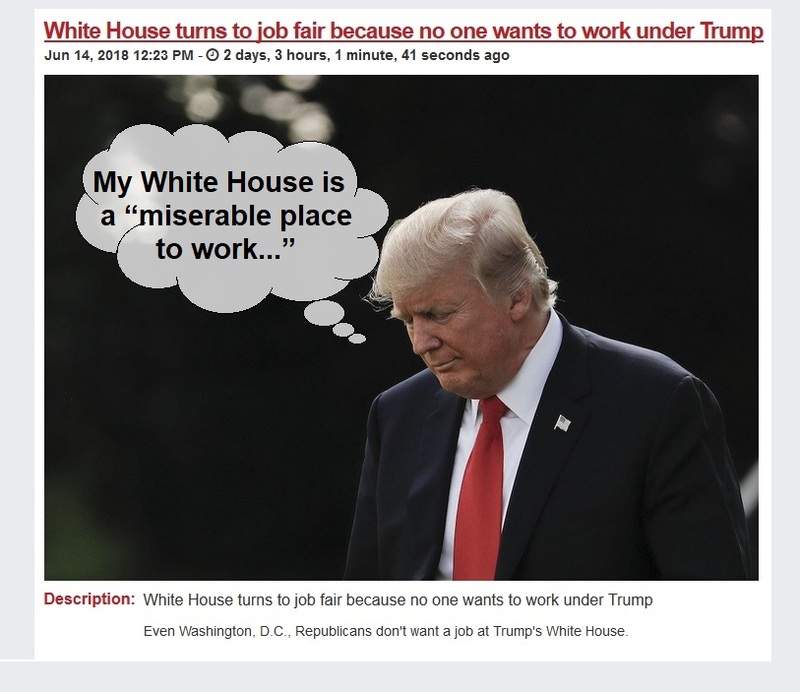 Earlier this year, a string of high-profile lawyers made it publicly known they would not take a job at the White House. 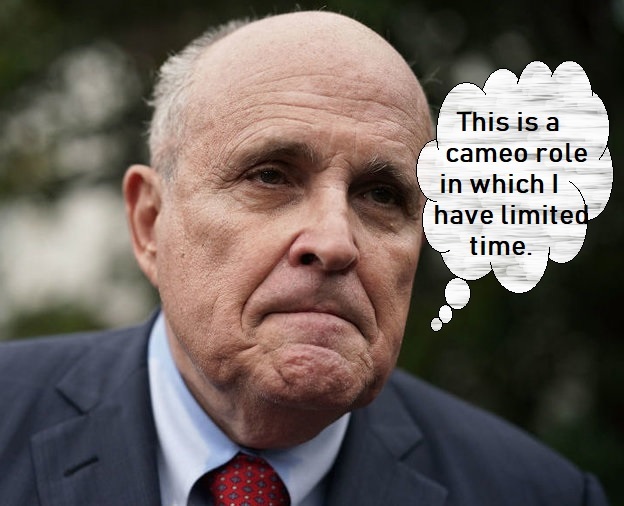 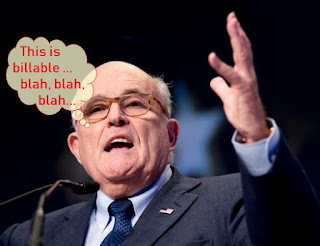 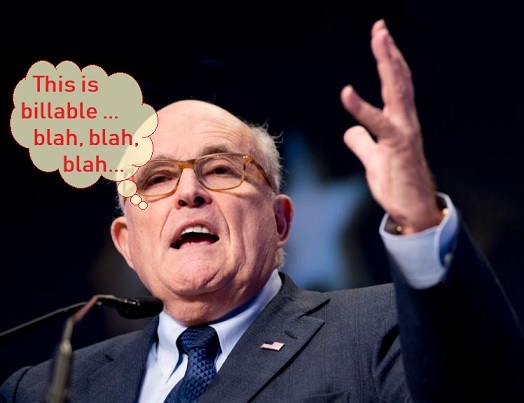 In the end, Trump settled for Rudy Giuliani, who has since made a big fool of himself and bigly fool Trump. 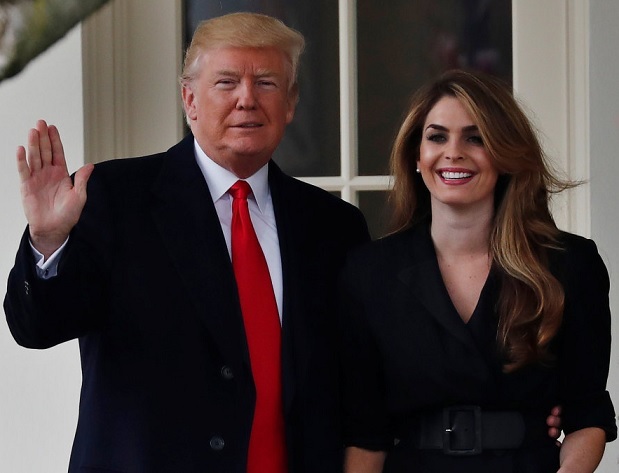 Meanwhile, the position of ‘communications director’ has remained vacant since Hope Hicks departed last March. 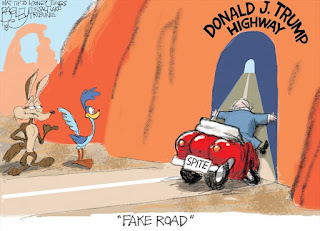 Did you hear about the poor Trump supporting Coyote that was caught in a trap? It chewed off three legs and then realized the very last leg was holding it in the trap! 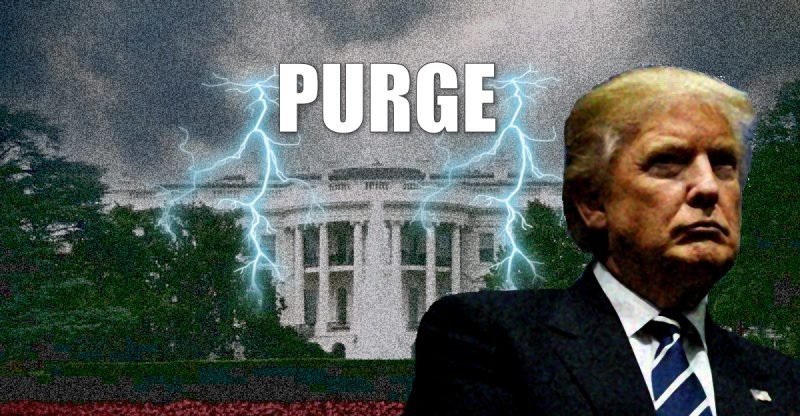 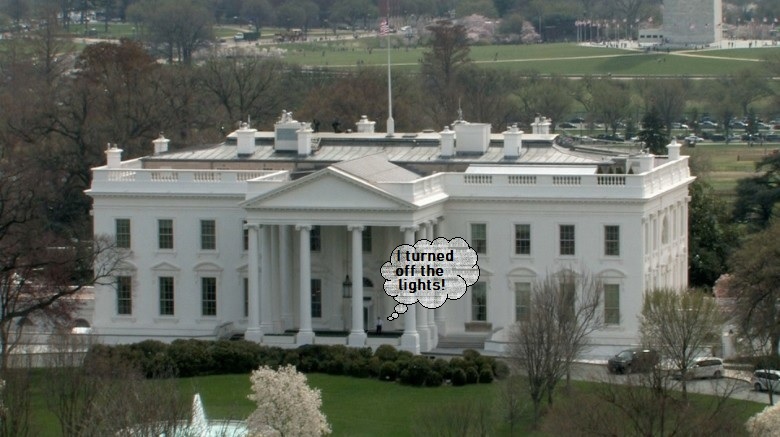 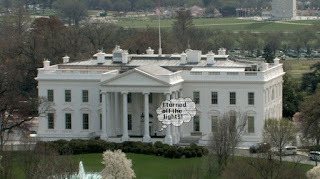 Last one to leave the white house, PLEASE turn out the lights.